A favorite Mexican dish of mine! The sauce is a little time consuming but well worth the effort as the dried Ancho lends a depth of flavor to the chicken enchiladas that dried chile powders can’t. Leftover roasted chicken would be a great way to repurpose last nights dinner for this fantastic chicken enchiladas recipe! Reconstitute the Ancho chiles by placing them in a bowl and covering them with boiling water. Make sure the chiles are submerged. (a small plate works well here) Cover the bowl with plastic wrap and let sit for about 20 minutes. Once the chiles are hydrated pull them apart from the stem and clean all of the seeds from the inside of the chiles by rinsing them in the hydrating liquid. Tear the chiles into 2-3” pieces and place in a blender. Strain and reserve about 1 cup of the hydrating liquid to use in the enchilada sauce. In the blender that has the chiles add the pureed chipotle, honey, 1 tablespoon of the cumin, garlic powder, coriander, fire roasted tomatoes and 1 cup of the hydrating liquid. Blend on high until smooth. Check consistency and add more water if the sauce appears too thick. Pour sauce into a 4-6 quart saucepan, cover and cook for about 15-20 minutes, stirring occasionally. This cooking process will eliminate a slightly bitter taste that the chiles have uncooked! Once the sauce has cooked, taste and adjust seasoning with salt and pepper. While the enchilada sauce is cooking, place a large skillet over a medium high heat. Add oil and when the oil is hot add the onions, garlic and a pinch or two of salt and pepper. Sauté for 8-10 minutes until the onion and garlic become slightly brown and fragrant. Add diced chicken to skillet-season with salt, pepper and the remaining tablespoon of cumin. Cook chicken until slightly browned-5 minutes. Add the rinsed beans and about 12 ounces of the enchilada sauce. Reduce heat and simmer for 5-10 minutes so that the flavors marry. Preheat oven to 375 with rack in top third of oven. Coat the bottom of a 9x9x13 glass baking dish with approximately 1 cup of the enchilada sauce and set aside. Place a tortilla on a cutting board and spread about ½ of a cup of the chicken mixture on the bottom third of the tortilla, leaving about 1” of the tortilla exposed on the bottom, left and right hand edges. Sprinkle a generous tablespoon of each of the cheeses over the chicken. Starting at the bottom-roll the tortilla 1 turn over the filling. Fold over the left and right edges of the tortilla and continue to roll. Place the enchilada flap side down in the prepared baking dish. Fill and roll 5 more enchiladas, placing them in the baking dish. 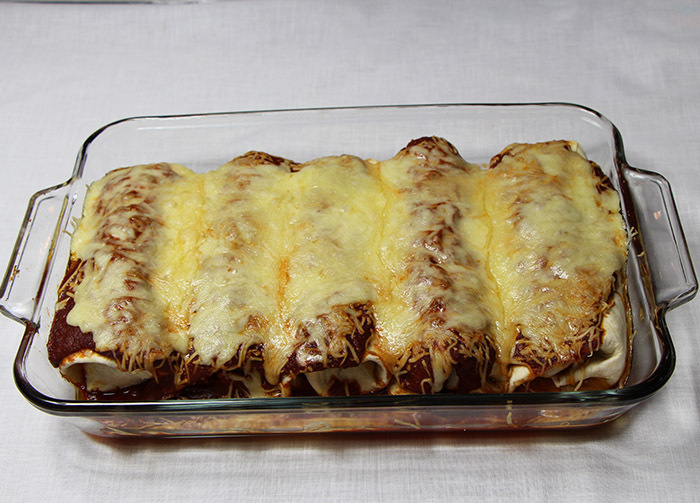 Cover the enchiladas with the sauce and top with the remaining cheeses. Bake in the oven, uncovered, fro 15-20 minutes, until the cheese is melted and the enchiladas are heated through. Serve hot and with a dollop of sour cream I desired! *To make the chipotle puree-simply puree the contents of a small can of the chipotles in adobo with a tablespoon or two of water in a blender until smooth.